G-Biosciences' Rapid DNA Template Prep™ kit is suitable for the preparation of DNA templates from blood, cells, animal tissues and plant samples. 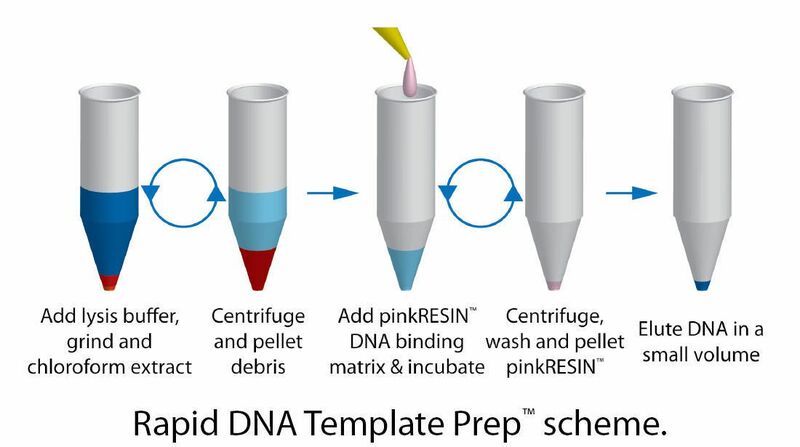 G-Biosciences' Rapid DNA Template Prep™ method involves solubilization of a sample in Template Extraction Buffer, followed by the selective binding of DNA to our proprietary pinkRESIN™. Following a washing step, the DNA template is eluted from the pinkRESIN™ with a small volume of elution buffer. The isolated template is suitable for PCR and other applications. 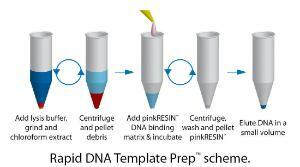 With G-Biosciences' Rapid DNA Template Prep™ kit, one preparation is for 1-10 mg animal tissue or 50-100 mg plant tissue.